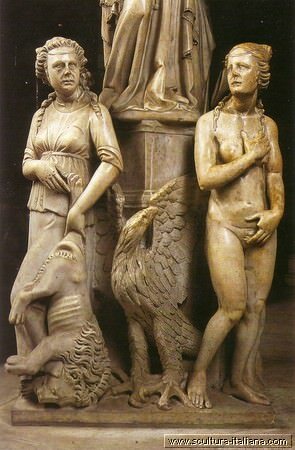 "…Nicola, and Giovanni Pisano… for the reason that their works in sculpture and in architecture truly deserve to be celebrated, since both in working marble and in building they swept away in great part that old Greek manner, rude and void of proportion, showing better invention in their stories and giving better attitudes to their figures"
He was trained at the school of his father Nicola, being, however, more evidently exposed to the Gothic influences coming from beyond the Alps, with which he probably came into contact during a trip to France between 1270 and 1275. 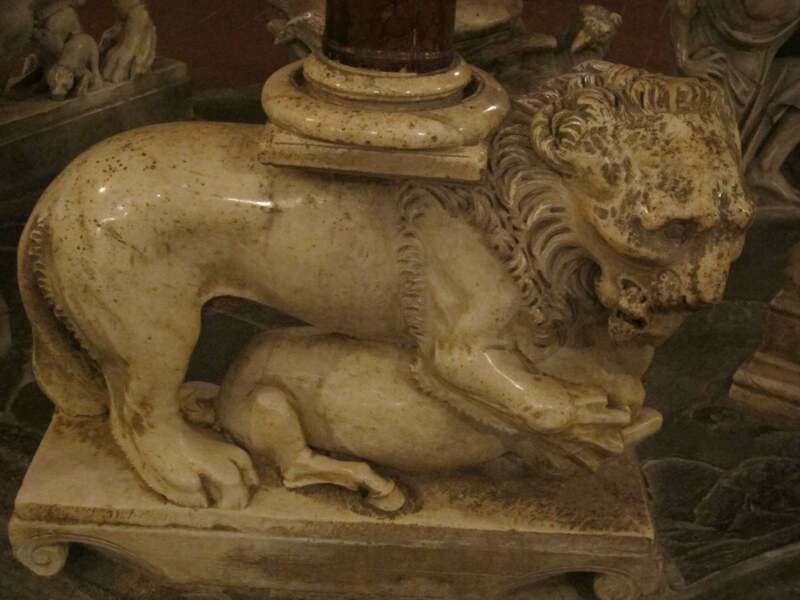 At a young age, he collaborated on his father’s famous pulpits for the Baptistery of Pisa and Duomo in Siena and was also a member of the father’s team who worked on Fontana Maggiore in Perugia – completed in 1278 – on which his name is carved too. 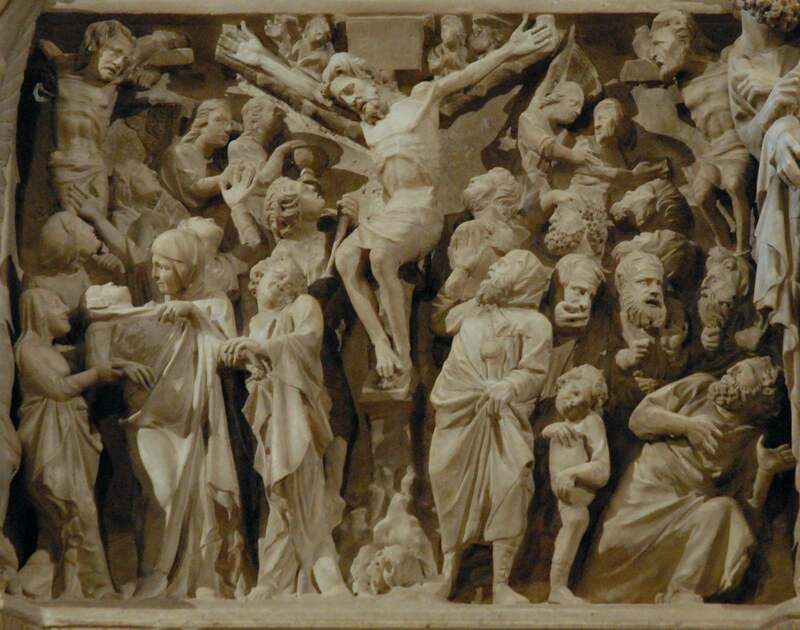 We can indicatively attribute to him, to his father, or to both, some reliefs representing scenes from the Passion of Christ – the Crucifixion, Deposition and Resurrection – on the façade of the Duomo in Pietrasanta. 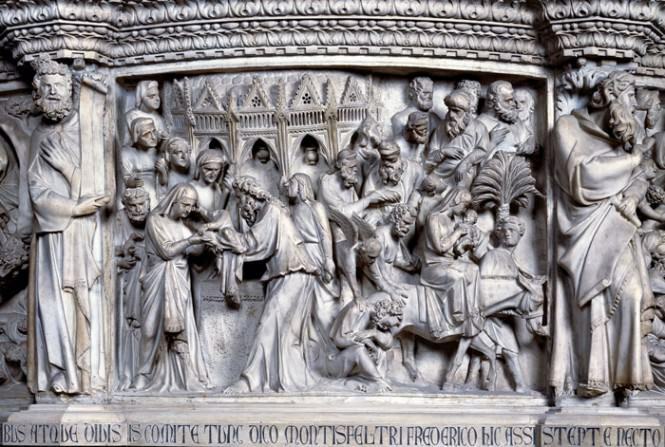 From 1285 until 1296, he was master builder for the works on the Duomo in Siena: he made, in particular, the monumental façade characterized by remarkable reliefs on its lower part, for which he erected a large number of statues of Prophets and Wise Men of ancient times, today housed at Museo dell'Opera Metropolitana del Duomo. 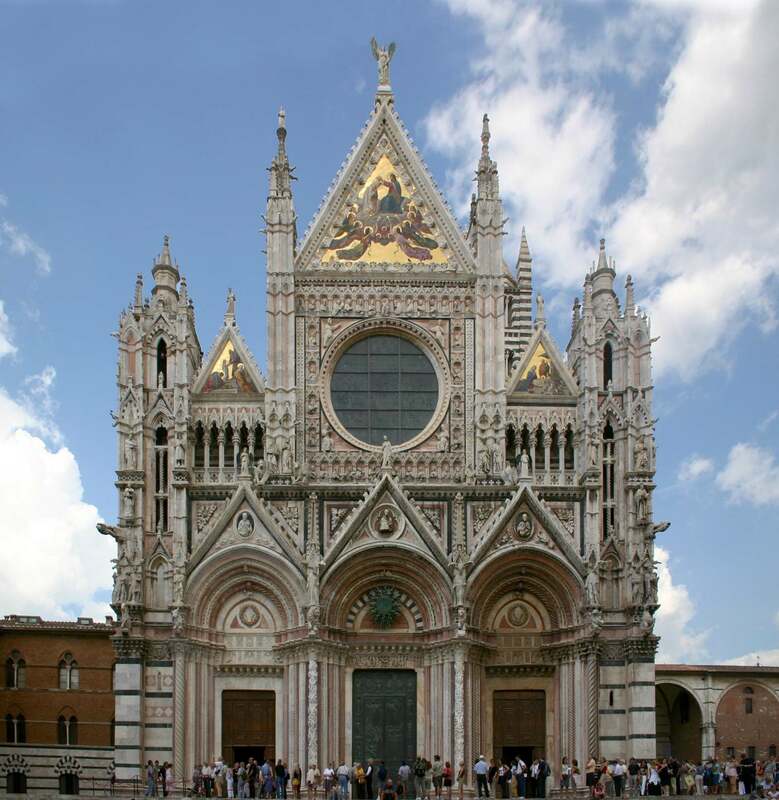 Despite the considerable success and recognition achieved in the period spent in Siena, in 1296 he unexpectedly abandoned the construction site, probably because of supervening dissents with the municipality. 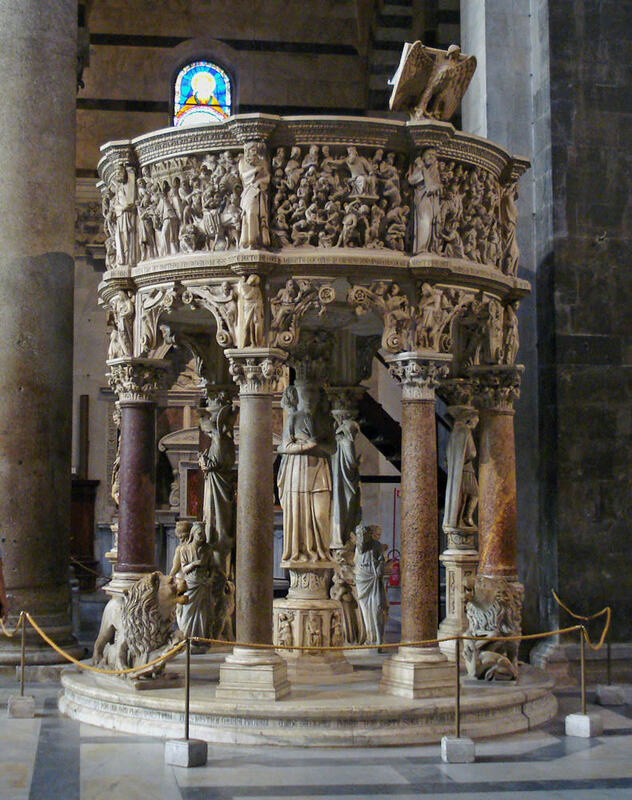 In the following years, he worked on another pulpit, this time on his own, for the church of Sant’Andrea in Pistoia, completed in 1301. 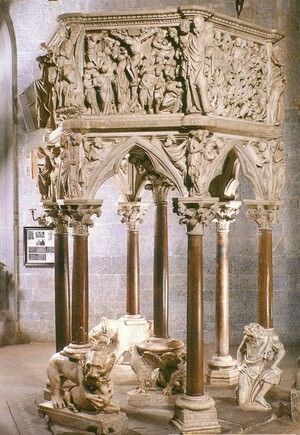 Of course, literature immediately underscored the outcome of the comparison with his father’s works: he was definitely inspired by the pulpit of the Baptistery of Pisa for its structure with seven columns and for the iconographic programme representing events of the life of Christ. 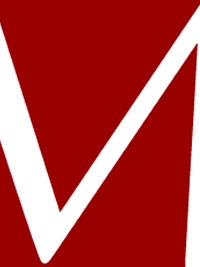 It departs from his father’s work for a more composite organization of the units with abrupt light effects and differences in the dimensions of reliefs, in a strong tendency towards dynamism. 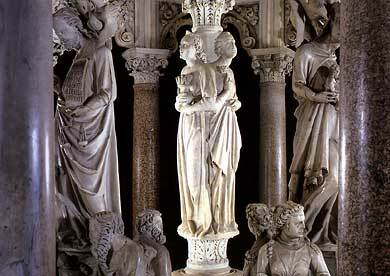 His most famous piece is the pulpit for the Duomo in Pisa, sculpted between 1301 and 1310. This work is the expression of his genius, both for its compositional innovation and for the exquisiteness of its decorative elements. It is supported by nine columns, some of which are caryatid columns – allegories of the cardinal virtues – or telamon columns. 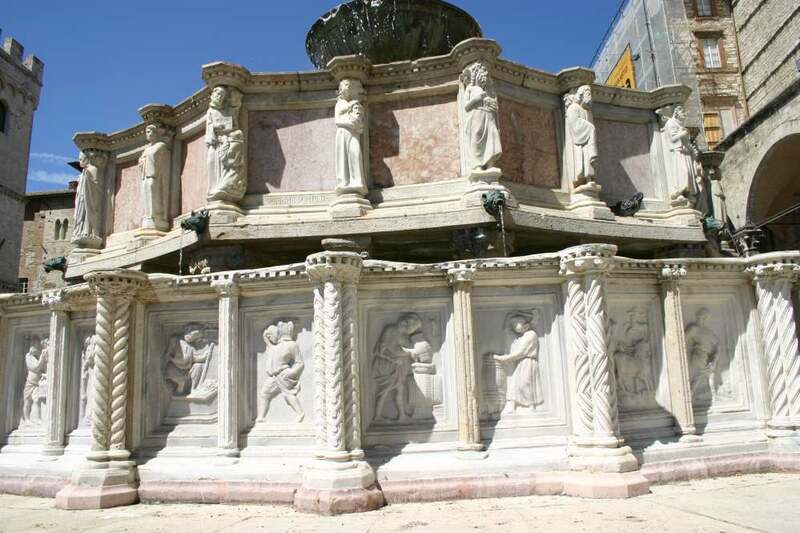 Each figure has a stratification of meanings, being at the same time the personification of a virtue but also a reference to the four parts of the world, to the four rivers of Paradise and to the four ages of woman. The upper frieze appears almost circular, thanks to the artifice of arched parapets, and represents scenes from the life of Christ alternated with figures of prophets. 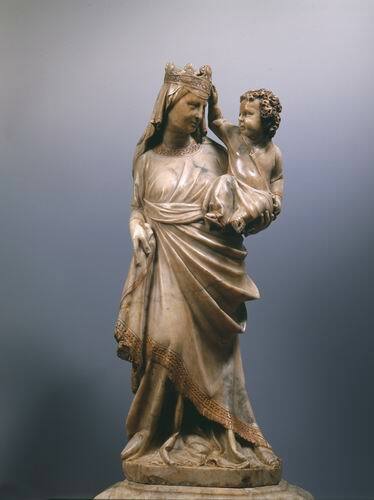 His last documented work dates back to 1313-1314: the funerary monument to Margaret of Brabant, wife of Henry VII of Luxembourg, some parts of which are housed in Museo di Sant'Agostino and Palazzo Bianco in Genoa. The facial features are clearly inspired by Classicism; the theme is the rise to the Heavenly Kingdom accompanied by angels. 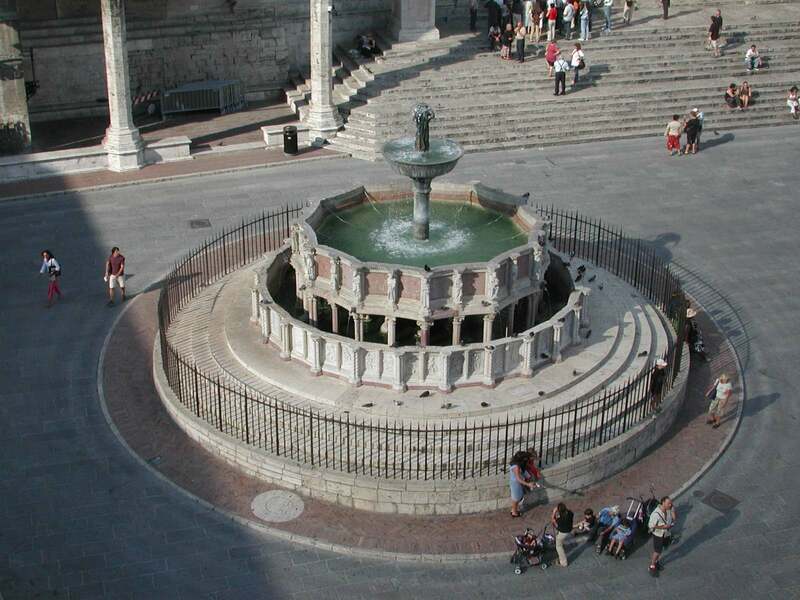 It is in those years that he returned to Siena, where he died in 1315.